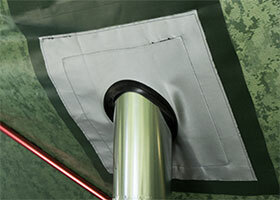 A stove jack allows you to safely extend a stovepipe through the roof or wall of your tent. Our stove jacks are constructed of fire proof 17-ounce [0.48 kg] silicone-coated glass material (18" x 18" [46 cm × 46 cm]) with a solid silicone ring. Stove jacks are temperature rated up to 700°F (400°C). Question: Why are stove jacks NOT normally made of metal? A. Metal would be difficult to transport. B. Metal would conduct heat to the flammable tent fabric. To keep your tent from burning. 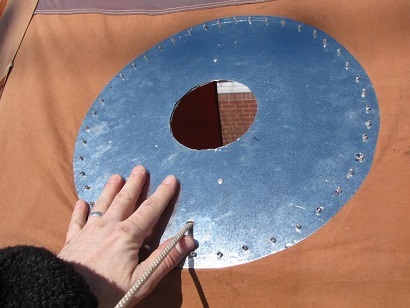 Making the stove jack out of metal, would conduct heat to from your stovepipe. This could cause your tent material to start to burn. Our stove jacks are contructed of fire proof 17-ounce silicone-coated glass material (18" x 18") with a solid silicone ring. Stove jacks are temperature rated up to 700°F (400°C). This material would be fire resistant and is also a poor conductor of heat (unlike metal) which would prevent your very hot stove pipe from accidentally setting your tent on fire. Not the answer you're looking for? Browse other questions tagged safety tents stoves winter-camping temperature or ask your own question. Which stove fuel has best weight to bulk to heat ratio? How can you make a MSR WhisperLite stove simmer? What material is the wick under the burner on a multi-fuel stove? Why is silnylon/silpoly slippery, but silicone sealant is not? How are canvas tents made to be fire retardant?